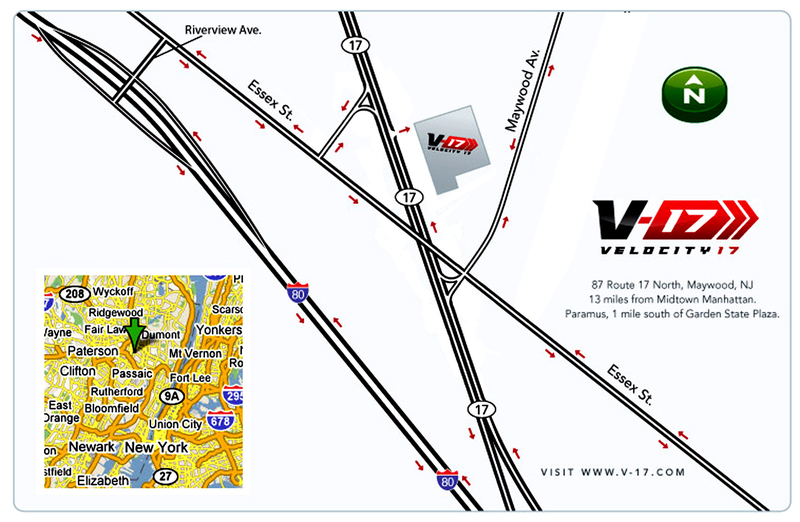 Velocity 17 is easily accessible from most points in the New York Metropolitan area. 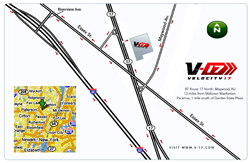 The entrance and exit for Velocity 17 is on Route 17 North, after the Essex Street exit. For information on buses from New York, visit www.njtransit.com. The nearest bus stop to Velocity 17 is Essex St and Maywood Ave.
Click here for directions to our building using larger map. Interstate Route 80 West to exit for State Route 17 North. Continue on Route 17 North, past the Essex Street and Maywood exit, go under the bridge and the Velocity 17 entrance is the first entrance on the right. Take Route 3 West to Route 17 North. Continue on Route 17 North, past the Essex Street and Maywood exit, go under the bridge and the Velocity 17 entrance is the first entrance on the right. Take Route 80 to exit for Essex Street / State Route 17. (Follow signs for State Route 17) Make left at top of ramp and then first right onto Essex St. Continue to next intersection which is Route 17. Cross over the Essex Street bridge and make a right turn at the traffic lights to go onto Route 17 North. Go under the bridge and the Velocity 17 entrance is the first entrance on the right. Take Route 17 South to the Essex St and Maywood exit. Make left at the traffic light, cross over the bridge and turn right at the traffic lights to go onto Route 17 North. Go under the bridge and the Velocity 17 entrance is the first entrance on the right. Take the Garden State Parkway South to exit 159. Take a right at the light onto West Passaic Avenue, and follow to Route 17 South. Continue on Route 17 South to Essex Street (one exit), make a a left and stay in right-hand lane to get onto Route 17 North. Velocity 17 is 300 feet on the right. Head north on the Garden State Parkway until you come to exit 129 for I95 North. Merge onto I95 North and continue on I95 until you reach the exit marked Route 17/Hackensack/Local. Take the exit to merge onto Route 80 West. After a short distance, take exit 64A to join Route 17 North. Pass the Essex Street/Maywood exit on Route 17, continue under the Essex Street bridge, and you will find Velocity 17 immediately past the bridge, the first entrance on your right. Take I95 North until you reach the beginning of Route 80 West (exit marked Route 17/Hackensack/Local). From Route 80 West, take exit 64A to join Route 17 North. Continue on Route 17 North, past the Essex Street/Maywood exit, continue under the Essex Street bridge, and Velocity 17 is the first entrance on the right.